Place 1 power counter on Overmind when it is installed for each unused MU. Hosted power counter: Break ice subroutine. 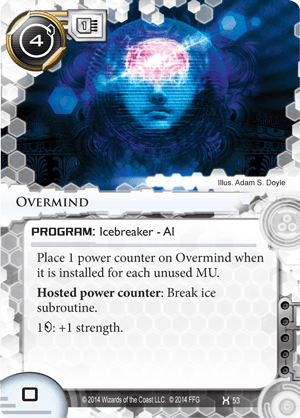 Overmind is an interesting card, a limited lifespan icebreaker with a set number of power counters on install, and obviously designed for a very sparse rig. Overmind is reliant on having at least 2 or more MU free before you install, remembering that it takes up 1MU after being installed, and then gets the power counters. • AI, so it can break anything. • Influence free AI breaker is eminently splashable. • Strength 0, pumping for 1/+1 makes big ice costly to break. • Needs to have plenty of spare MU to make installing it worthwhile. • Takes up 1MU itself, so installing into the last free MU slot gives no power counters. • AI breaker cannot be hosted on Dinosaurus. • Deep Red's 3MU dedicated to Caissa still count as unused memory for adding power counters if no Caissa are installed. • e3 Feedback Implants saves you power counters. • Scavenge to trash & install Overmind, replenishing power counters for free. • Cloud breakers (Creeper & ZU.13) take up no MU if link is 2+. • Trashable breakers (Deus X, Faerie, etc.) clear MU space for Overmind (re-)installs. • Overmind is installed, and its MU counts against your memory limit, when it gains power counters. So if you have 3 MU before installing, you only get 2 Power Counters on Overmind.